Power Over Ethernet (PoE). - Web. - Modbus. - SNMP - SNMP Traps - Email - SMS - Voice Call - Rack Mountable - Industrial Grade. - TraceTek TT1000 - IP 68. - 5m/17ft reusable water sensitive cable. - optional cable lengths of up to 100m/300 ft available. - detects water on the flooring, around pipes, or under raised floors. - triggers an alert when water touches cable. - IP68 housing: just put it anywhere under your raised floor and let it monitor for you. Integration with BMS systems using Modbus TCP. Integration with NMS through SNMP GET & SNMP TRAPS. Check out the video to see how simple it is and how it works. US Made Leak Detection Cables. 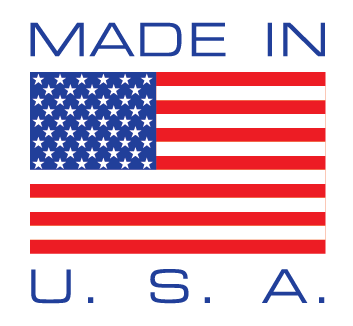 Our water leak detection sensing cables are proudly manufactured in the USA. The sensing cables are mechanically strong and resistant to corrosion and abrasion. Durable. Reusable. Industrial grade. Protecting your infrastructure & facilities. Haven't checked out the above video? Following illustration will show you how our water leak detection system works. The flooding sensor connects to a base unit using a standard RJ45 network cable. The network cable tranmits data and power from the base unit to the water sensor. The sensor comes with a 5m/17ft reusable water sensitive cable. The cable can be daisy chained up to 102m/330ft. The cable is constructed of two sensing wires, an alarm signal wire, and a continuity wire embedded in a fluoropolymer carrier rod. The sensor constantly monitors the sensing cable for continuity. Wondering how to setup the leak sensor or where to put the cables? We've compiled a quick guide that outlines the do's and don'ts for leak sensing cables. Getting an alert when a leak is detected is great. But where is it? Find leaks is what makes the difference. And that's what ServersCheck does. 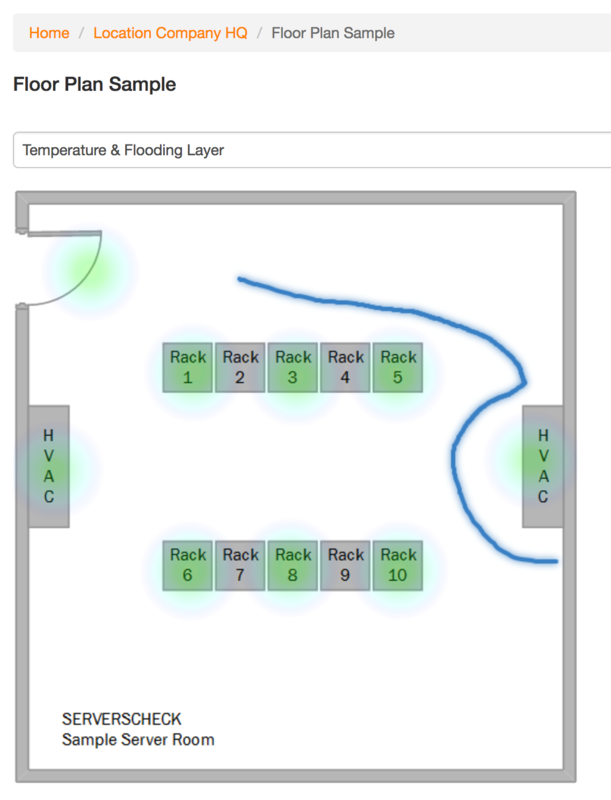 With the latest edition of our Monitoring Software or Monitoring Appliance you can now plot the leak sensors on your floor plans, building maps and the software will automatically change the color when a leak is detected. Housing Dimensions: 65 mm (2.5") x 95 mm (3.74") x 55 mm (2.16"). Sensor Housing Material: IP 68 plastic housing. Sensor Housing Colour: light gray. RJ45 cable gland protection rating: IP 68. Sensing cables are approved for installation in ordinary and hazardous areas. 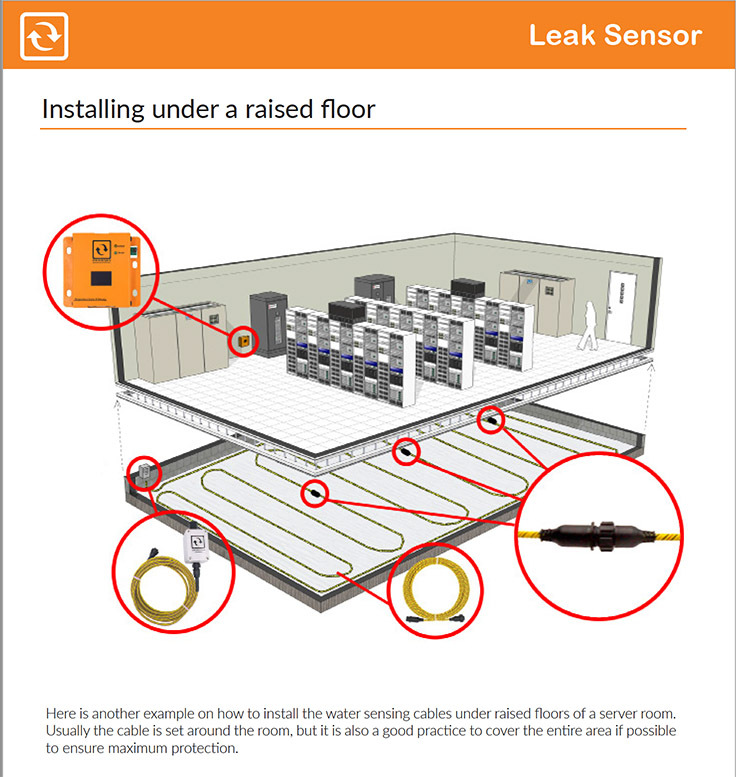 Water Leak Sensing Cable: 5m/17ft cable to detect water on floors (ENV-WLEAK-5M). The main application of our leak detection system is for industrial and commercial buildings. Leak detection is what protects your infrastructure. Water and electricity just don't mix. But there are more reasons for monitoring water ingress, leaks and flooding in facilities. Water damage refers to the intrusion of water into buildings. The damage can take a few hours or a few months to reveal itself. It causes a major loss of property in most cases. Water damage is most ruinous in offices and factories. In early stages, you will see water spots on surfaces. This is usually ignored and thought to be “normal”. It is typically considered part of a building’s wear and tear. However, it can turn into a big problem. In later stages, you could see corrosion on equipment, rust, and more. By this point, the damage is very bad. It will not be easy to fix. This will be discussed in more detail later. Water damage is actually very common. It occurs three times more often than fire damage. In fact, 14,000 buildings in the US experience water damage per day. It can not only occur in commercial buildings but also offices, schools, ie. in any type of building. Water damage insurance companies end up paying over 2 billion dollars a year. This is just to cover the costs of water damage to buildings! Water damage claims are the fastest growing claims right now. Many people overlook just how serious a threat water damage is to their buildings. This is largely due to most of the damage being under the floors. The damage is also sometimes behind the walls. There, it is not clearly visible and is easily forgotten about. However, water damage can be incredibly expensive. It can even cause up to multi-million dollars in irreparable damage! Having a water ingress detection system is therefore very important. Water damage can then be detected early. It will not be given a chance to turn into something too serious. Water damage typically occurs due to plumbing. Maybe a water installment was not properly fixed or not replaced when worn out. It could then lead to a leak. To avoid such leaks, visual checks should be done often. A better way to do it is to install water sensors in your facilities. This is so water damage can be discovered before it becomes too severe. Sometimes, natural causes such as heavy rain or a thunderstorm can cause water damage. Of course, this cannot be prevented. Having a leak finding and detection system will help you identify the water damage. In offices, most companies spend thousands, even millions of dollars to facilitate maximum uptime. 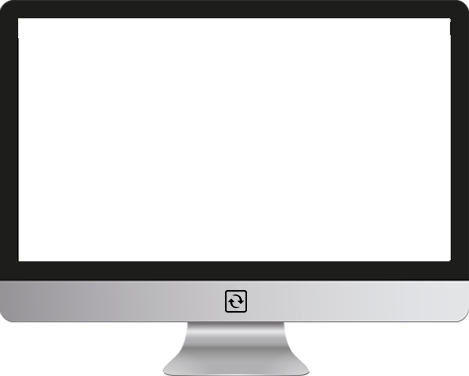 “Uptime” refers to the amount of time that a computer or machine is operating. In doing so, they forget that water damage can severely affect their uptime. They do not invest in having a leak detector. But once water gets into a machine, it stops working. Sometimes, insurance does not cover the damage. Even more money is then required to fix the machine. In some cases, a new machine will have to be bought. Uptime is then negatively affected. This problem is easily fixed by simply remembering to check for water damage. The best solution is to install a water leak detector. A detector will set off an alarm if there is a water leak. Steps can then be taken to quickly nip it in the bud. This will prevent severe water leaks. There are many effects of water damage. It damages furniture, electronics, plumbing equipment, etc. All types of materials will be damaged if exposed to water. This includes cement, wood, metal, and more. Therefore, it is very important to detect and prevent water leaks and damage. Sometimes, mold will begin to grow. This happens if water damage is not dealt with within 48 hours. Mold growth is a problem in itself. It can cause migraines, allergies, rashes, skin infections and more! It is also expensive to fix. Did you know that water ingress detection systems may qualify you for credits on your insurance? The same goes for temperature monitoring systems. Speak to your insurance company if you are considering installing such a system. You may think your data centers and server rooms are free from water damage. There isn’t even any water there to begin with! However, this is not true. Data Centers have a big hidden water use and actually highly depend on water. California houses more than 800 large data centers that consume about 158,000 Olympic swimming pools of water. The main reason for using water in data centers is that cooling requires a lot of water. A medium data center needs around 400 million liters of water a year! A data center can use more clean water than an entire town. The Utah Data Center is also known as the Intelligence Community Comprehensive National Cybersecurity Initiative Data Center. That data center is expected to use 1.7 million gallons of water on a daily basis. Companies such as Microsoft and Google try to reduce their water needs. Whenever possible, they are using outside cooling or by collecting water from rain. Water is cheaper than electricity. As a result data centers will continue to rely on water as a main cooling resource. Water inside the data center is making a comeback. In the past data centers and server rooms were equipped with Halon fire surpression systems. This gas would prevent water damage. Halon is a gas on its way out. It is being banned due to its contribution to the damage of the Ozon layer. However Halon is known to destroy systems. Other alternative gasses are being banned too due to their negative impact on the environment. This leads data center operators to look at old school technology. Water as a fire surpression solution is on a way back. It allows operators to save big on their fire surpression systems. The latest trend is the use of HI-FOG systems. Similar to a traditional fog, an HI-FOG system generates a fog. But with very small drops of water. So small that it saves up to 90% when comparing to traditional water sprinklers. The common reasons for activating a disaster recovery plan in a data center are following. Water ingress, smoke, and electrical failure. So one out of 3 is water. Where does water damage come from in data centers or server rooms? Well, following are known common sources. - When air conditioning systems break down or leak. Air conditioners pull moisture out of the air. When an air conditioner’s drainage system is broken, the condensed moisture leaks into the walls instead. - When pipes running through the building have a leak. - When there is a water leak near the data center/server room. - When water leaks from the roof. - When traditional flooding occurs. Water quality is a contributing factor to the failure of HVAC systems. It happens slowly and is irreversible. At best this leads to a shorter lifespan of the equipment and piping. At worst, you have a leaking cooling system flooding your server room or data center. So water monitoring in a data center or server room is a must. It is not an option. Use a server room water sensor to detect flooding in server rooms. This is also known as a water leak detection system for server rooms. It will alert you whenever there is a water leak. For data centers, use a water leak detection system for data centers. These water leak detectors will alert you at the first sign of water damage. These two sensors will ensure the safety of your data centers and server rooms from water damage. Once you get an alert about a water leak, you can take immediate action. There is thus a much higher chance of you saving the equipment in the room. You do not want to face the effects of water damage. It can be very devastating. Go beyond your server rooms and data centers. Use a flooding sensor to detect and locate leaks from pipes running through your building. There are several types of pipes that can leak and cause water damage. Examples are humidification pipes, condensation pipes, and pipes used for water cooling. Luckily, a water flood sensor is extremely easy to set up. All you have to do is attach the water leak detection cable. Make sure it covers the entire length of the pipe. Any time the sensing cable’s detection senses a leak, it will notify you. You can then take immediate action before the situation gets worse. After every water leak, these cables have to be completely dried. Only once they are fully dry can they be used again. 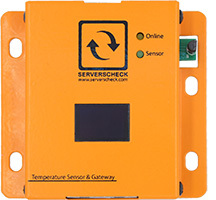 ServersCheck provides cheap water detectors for leak detection and water detection. It’s water sensor can detect even the slightest bit of water present on the floor or walls. You can monitor your building for water leaks, wetness, and flooding. It can also detect pipe leaks, leaks under raised floors, and more. The reliable tracetek TT1000 leak sensing cable is 17 feet (5 meters). It can also be extended up to 100 feet (30 meters). Any time any water touches the cable, an alarm will be triggered. This alarm is known as a water sensor alarm. An alert will then be sent to either your email or your phone. Alerts can also be sent via SNMP Traps. The liquid sensing cable is a product of Tracetek, part of Pentair Thermal. All cables are manufactured in the USA. ServersCheck offers the most cost effective IP based solution for Tracetek leak detection. It is the first smart tracetek systems monitoring solution. The water leak sensor is easy to integrate into your Building Management System (BMS). Just use Modbus TCP. If you want to integrate it into your Network Monitoring Systems (NMS), use SNMP. The ServersCheck water leak detection systems is designed for industrial and commercial use; NOT for residential / home use.